Abergavenny Castle, is a picturesque ruined Norman fortress set against the spectacular hills surrounding the town of Abergavenny in Monmouthshire, Wales. 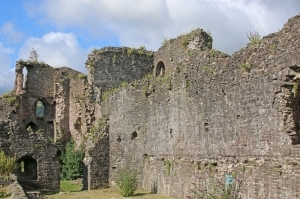 It is an impressive ruin which was originally built by the Normans to guard against incursions from the lowland areas from the southern and eastern sides of the town. It is in fact perfectly positioned to do this since it is located immediately to the south of the town centre, overlooking the River Usk and its valley. Although most of the Castle fell victim of the Civil War slighting and general plunder, enough remains to show that it was once an impressive structure and an important focal point. The Castle is surrounded by a dry ditch rather than a moat. One approaches the Castle through its gatehouse, which is the part of the Castle which was built last, around 1400. This gatehouse had a long narrow vaulted passageway, having also inbuilt rooms above. It was a typical barbican gatehouse of the time. The remains of a huge fireplace on the south side are still visible. Unfortunately the keep, along with most of the other Castle buildings, was destroyed during the Civil War as well. To the right of the gatehouse, there is a picturesque stretch of curtain wall standing almost to its full height and retaining most of its facing stone. This was built during the second half of the 12th century, most probably when William de Braose held the lordship. Only fragments of the rest of the curtain wall remain. These are to be found on the eastern side, where the stub of a rectangular tower is also visible. On the northern side, the curtain wall was reduced so much that it was landscaped into a rock garden in the late 19th century. The motte was probably built by the Norman Lord Hamelin de Ballon in 1087AD. Beneath it there was a bailey – a courtyard containing the outbuildings and the stables. Today, a Victorian keep built in 1819 stands on the foundations of the oldest part of the Castle. 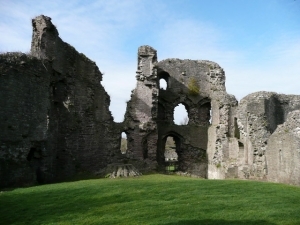 The keep too had been originally built early during the 12th century by de Ballon, who also founded the Benedictine priory of Abergavenny. The hall, situated between the gatehouse and the keep, had remained a timber building even during the 12th century, however there was much building and renovation during the 13th and 14th centuries when the Castle was held by the Hastings family. The two towers in the west corner are perhaps the most prominent remains attributed to this time. One of the towers is polygonal and the other circular. Evidence suggests that the towers were built between 1295 and 1314, at the same time as the town walls. Only their outer wall still survives today, yet this stands up to four storeys in some places. The octagonal tower has large window openings. Attached to the eastern side of the towers there is a cross-wall, which divided the Castle-ward in two. Its northern end was one wall of the hall, and has a doorway which led into rooms below it. Today the ground where the hall once stood is sunken, and its inner wall has completely gone. In the middle of the lawn there is an underground room, which is believed to have been a dungeon. The refurbished 19th century square-shaped Keep, later used as a hunting lodge by Henry Neville, 2nd Earl of Abergavenny in 1819, today houses the Abergavenny Museum, which has an interesting collection of artefacts, a reproduction of a Victorian Welsh farmhouse kitchen and a saddler’s workshop among other displays. It also hosts a number of different exhibitions throughout the year. The displays tell the story of the historic market town from prehistoric times through to the present day. The displays are on several levels, most of which are accessible to wheelchair users. One can also wander through the amazing formal public garden created by William Neville 5th Earl of Abergavenny during the 19th century, having views overlooking the Usk Valleys, picturesque walks, gardens and gazebos. This garden is today included in the National Register of Historic Parks and Gardens. 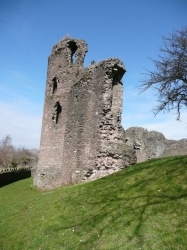 The Castle is located just a short walk from the main shopping area of Abergavenny. There is also ample parking close by.